Do you want it personalized? 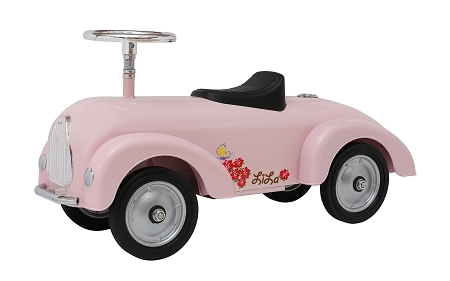 Pretty pink ride-on scoot-ster will go as fast as her little legs allow! Features floral detailing, working steering wheel and rubber wheels, and its heavy gauge steel body will be both fun and safe to "drive." Plastic fenders protect walls and furniture. Finished in a chip and rust resistant, child safe, non-toxic, lead-free powder coating paint. 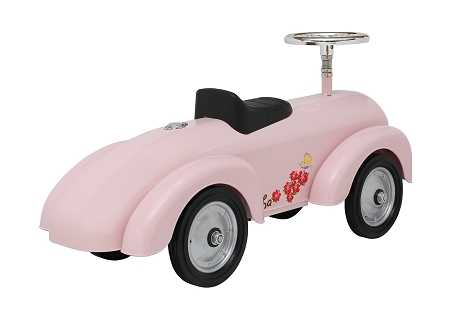 Don't forget our Personalized Pink Car is the perfect gift! Delivered fully assembled. Morgan Cycle warrants our products against defects in materials and workmanship for a period of 30 days from receipt by the original end-user purchaser, proof of purchase from authorized Morgan Cycle retailer required. This items ships from the warehouse in NJ by FedEx Ground. Expedited shipping is available. All international customers must use the International Checkout Button for a international shipping quote prior to purchase.